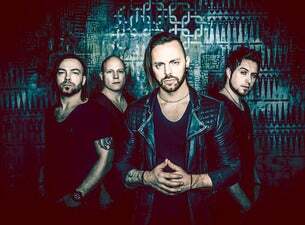 Bullet for My Valentine is a heavy metal band from Wales. They released their debut album in 2005, yet they had originally formed as a band in 1998 under the name of Jeff Killed John. Although they did record songs as Jeff Killed John they were not released as official singles or albums, although they did release a number of EPs before their first album. Years later a couple of early tracks were reworked and released under the Bullet for My Valentine name. In their early years, before official singles and album releases, they performed cover versions of popular heavy metal bands such as Metallica and Nirvana, whom they list among their influences along with Iron Maiden and Slayer. Over the years the band have collected an enviable cabinet of awards starting with their Best Newcomer award at the Welsh Music Awards in 2004. They won the Best British Band Award twice at the Metal Hammer Golden God Awards first in 2006 and the in 2010. They have been regular award recipients at the Kerrang! Awards including Best British Band three years in a row from 2008 to 2010. Bullet For My Valentine performed a series of shows in November 2018, and they're set to perform a gig in Scotland and at Slam Dunk Festival this May.